As the sun begins to go down, the sky and the surroundings transform themselves into a star-filled sky. The breathtaking transformation from day to night is one of the most cherished moments to witness that would capture memories which last a lifetime. People tend to travel across the globe to capture the sinking of the horizon into various landscapes though watching the sun setting across the skies of India can be one of the best travel experiences. There are quite a lot of sunset spots in the country, here are a few such places which are worth visiting. As the sun begins to go down with this majestic monument as the background, the view surely makes for a breathtaking moment for the observer. One can find every detail in the sky from the scattering of clouds to the birds chirping away to their nests and this gives one the feeling of being a part of a painting with the white marble structure casting a shadow across the area. Kanyakumari was formerly known as Cape Comorin and is the southernmost tip of India. The place is also the confluence point of the Arabian Sea, Bay of Bengal and the Indian Ocean, this makes it one of the best points to view the sun setting. The twinkling sky meets the waters which gives the illusion of a cloud-like landscape that leads to a mystically experience. Although almost every beach in Goa would gift you a chance to catch the sun setting, nothing would beat watching it at the shores of Palolem Beach. The sparkling water surface emerges along with the tinted sky making it one of the best spots for witnessing sunsets in the country. The coasts of Fort Kochi are filled with Chinese fishing nets which adds to the rest of the view and forms a perfect backdrop while the sun makes its way down in the western direction. Apart from the Chinese nets, the coast has quite a number of cafes lined up if you want to sip on a cup of coffee and enjoy the sight of the sun making its way for the stars to glow. The Radhanagar Beach has gained the name and fame of being one of the best beaches in Asia. The shoreline of the beach is filled with white sand which changes to the hues of golden as the sun casts its reflection on it while making its way down deep into the sea. Now picture, clear blue water along with the golden hues of the setting sun which creates a magical mixture of colours. The unparalleled beauty of nature which is found in the region of Leh simply makes it a picture-perfect destination to catch the sunset. Every single frame automatically transforms itself into a piece of magic; the valleys, the monasteries, the unpolluted environment and many more features add on to the beauty of the setting sun and also the rising sun which is definitely not to be missed. Spirituality on your cards? If so, then without second thoughts, you need to witness this beautiful sight amidst oil lamps, chants, vibrant colours, etc. Watching the sun bidding goodbye for the day is truly a magnificent sight to see. The unmatched beauty of the sun setting at the Umiam Lake in Meghalaya is an example of looking through a kaleidoscope of colours which are scattered across the sky. The lake is prized pit stop in the abode of clouds which is complete with the breathtaking view of the green surroundings. An experience which is not be missed when in Srinagar is watching the sun set in the ever-charming Dal lake. The spectacle becomes even more beautiful if you happen to witness it through the windows of the shikaras which float on the lake. 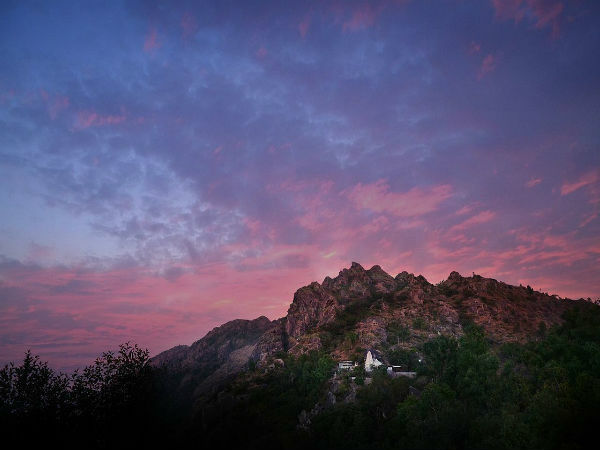 Mount Abu, one of the holiest places for the followers of Jainism with the most beautiful monuments ever made, is an amazing place to watch the sunset. The beauty of the marble structures gets an additional charm when the setting sun makes its mark on these shrines. It is truly a sight which cannot be described in words and one needs to experience it at least once in a lifetime.